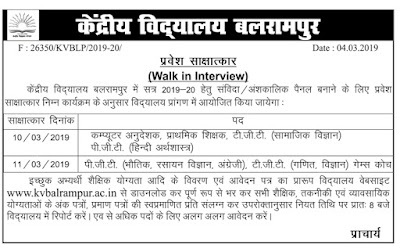 KV School Balrampur Recruitment 2019 offline application are invited to fill Computer Teacher, Instructor, Games Coach, TGT PGT and Primary Teacher vacancy in Kendriya Vidyalaya Balrampur Recruitment 2018. UP Pashu Swasthya Karyakarta Bharti 2019 Online application is invited from Bhartiya Pashupalan Nigam recently invited 1000 posts of Pashu Swasthya Karyakarta in Uttar Pradesh Gram panchayat. Candidates who are interested to fill or become Animal husbandary Worker in their home district they must check below qualification. 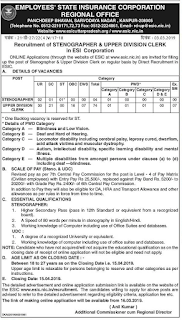 ESIC Kanpur UDC Clerk Recruitment 2019 apply Online for 78 posts, 4 Stenographer & 74 UDC Clerk recruitment on 7th pay commission from 16 March TO 15 April 2019.